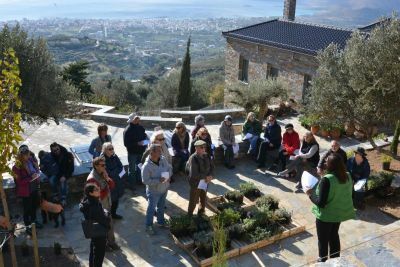 The Greece Branch welcomes all gardeners and want-to be-gardeners of all ages and from all backgrounds. Our members are spread out across Greece and range from people who have large designed gardens to those who live in the city and get creative on a tiny balcony. We regularly get together to visit gardens of interest, both private and public, visit local nurseries, hear talks by experts and participate in workshops. 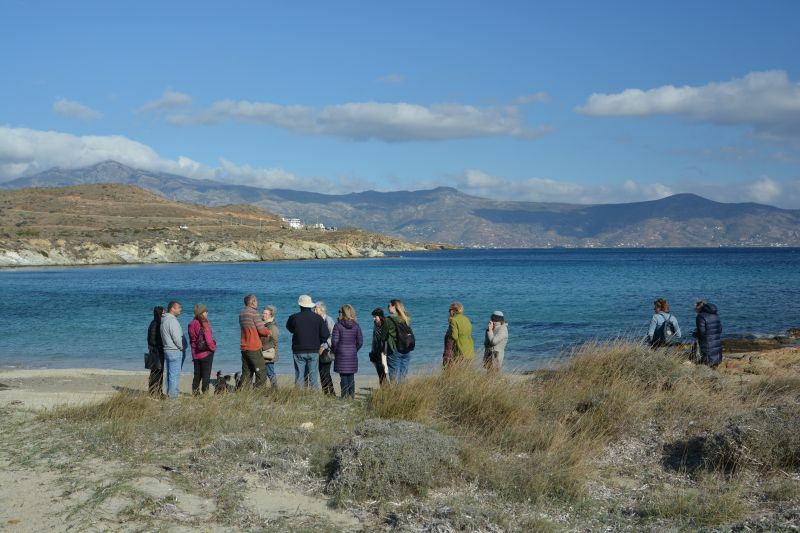 A couple of times a year we arrange a weekend away to other regions of this beautiful and fascinating country to explore and connect with members who are not resident in the Athens area. We try to offer a diverse range of activities to appeal to our broad membership. 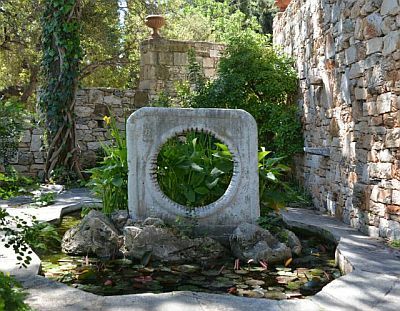 The Greece Branch is home to the wonderful garden of Sparoza, the centre of the MGS. Some of our members volunteer weekly (Thursday 10-12) to help take care of the garden. If you would like to join us contact Vina, the volunteer coordinator, for more details. 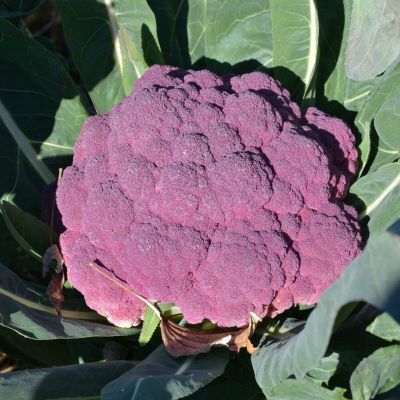 Twice a year we host a seed and plant exchange at Sparoza. 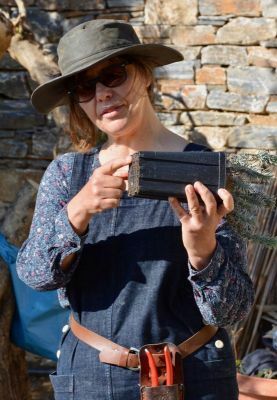 Members, their friends and family are invited to the garden to stock up on healthy plants propagated by Sally Razelou, the custodian of Sparoza, from seeds and cuttings from the garden. 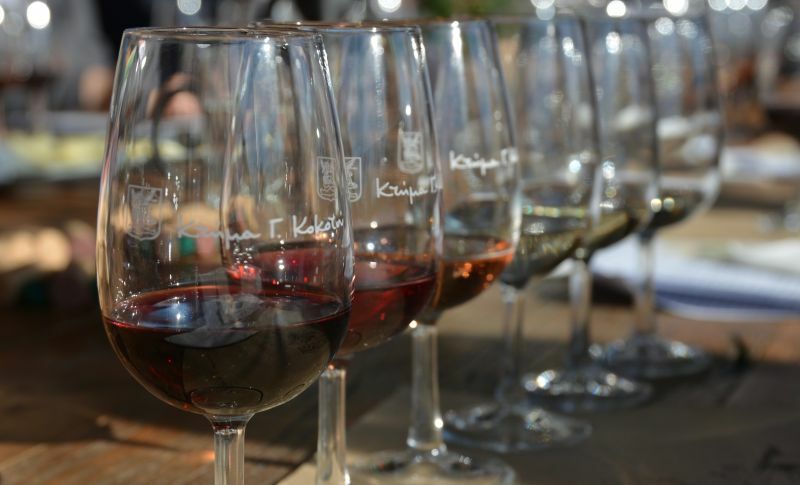 These events are held in the Spring and Autumn on dates that are posted on our website. We also invite our members to get together at two relaxed dinners/lunches at Sparoza - one just before the Christmas holidays and one before our long summer recess. Our Branch Head is Christina Lambert (biography) and current and prospective members are welcome to contact her by email. The photograph at the top of this page shows an olive grove in spring carpeted with wild Anemone coronaria. 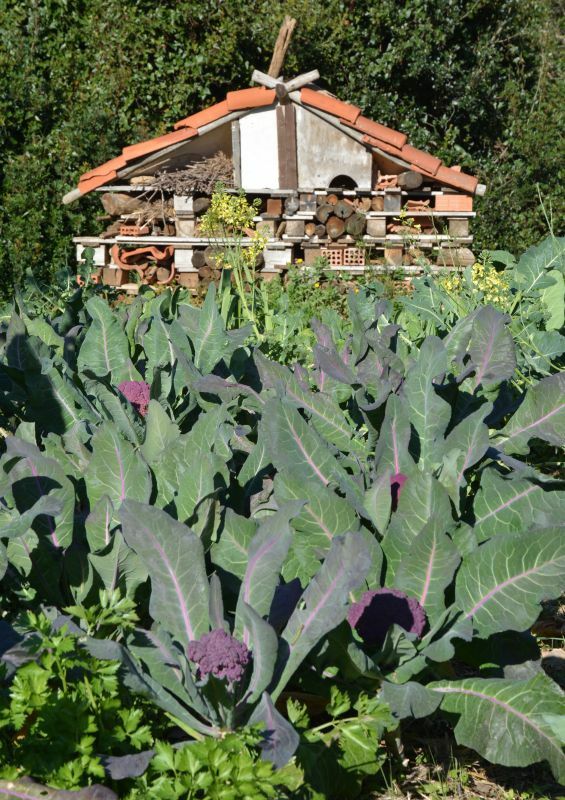 We are lucky that here in Greece not all the natural flora has been destroyed by intensive farming. 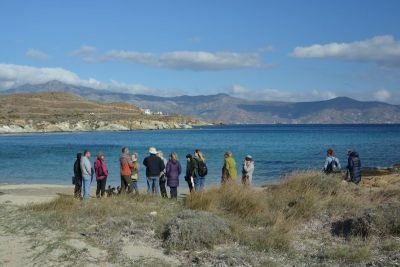 We all met up at the port of Rafina outside Athens and crossed by ferry to the southernmost part of the island of Evia - the second largest island in Greece. We were lucky that the weather was perfect for us as recently we have been having some cold and rainy days. From the port of Marmari we drove up to Lilian Lorenz’s property on the mountainside behind the seaside town of Karistos, and took in the spectacular view from her new house. Lilian gave us an introductory talk about the planning and work that has gone into building and landscaping their new house and its surroundings. The house is as eco-friendly as it could be within the restrictions of the law. 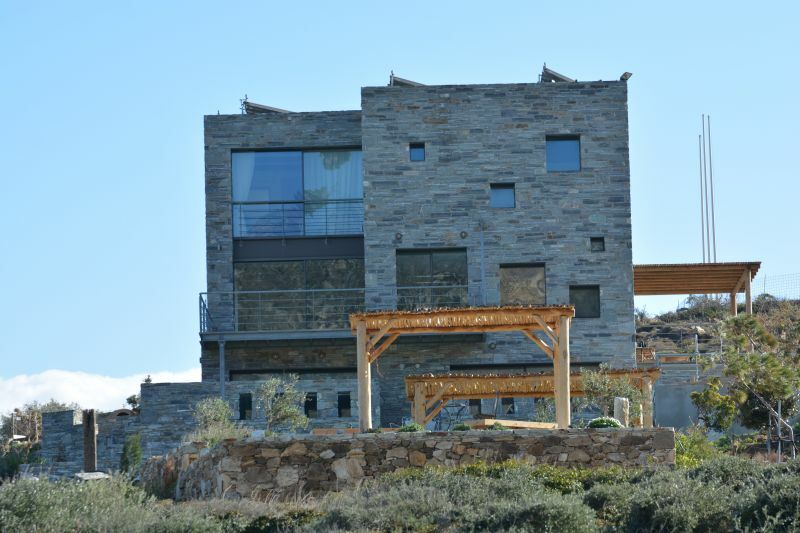 The house has geothermal heating and large water-storage facilities. The driveway has been constructed to enable the collection of water and the watering of the beds in this area of the garden. We were then given a talk by Jennifer Gay, who has designed the planting of the garden and was in the process, with her team, of planting. 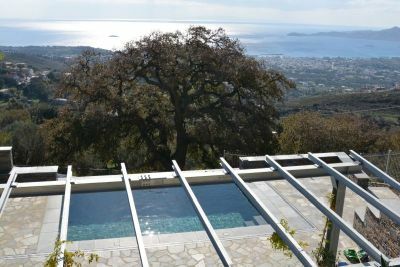 She told us about the challenges of this particular garden, one of which is that it has to complete with not just one, but two spectacular views: one over the sea and another over the Kokkino Kastro - a large castle ruin to the southeast of the property. The weather is challenging in the garden with a huge variety of temperature even over the course of a day and very strong winds. 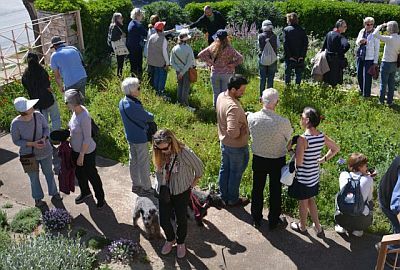 After we had been told about the concepts and planting for the four distinct areas of the garden we walked round with Jennifer and she answered questions from our members. All too soon we had to move on and were led by MGS member James Brown to his very different property and garden next to the sea outside Karystos. 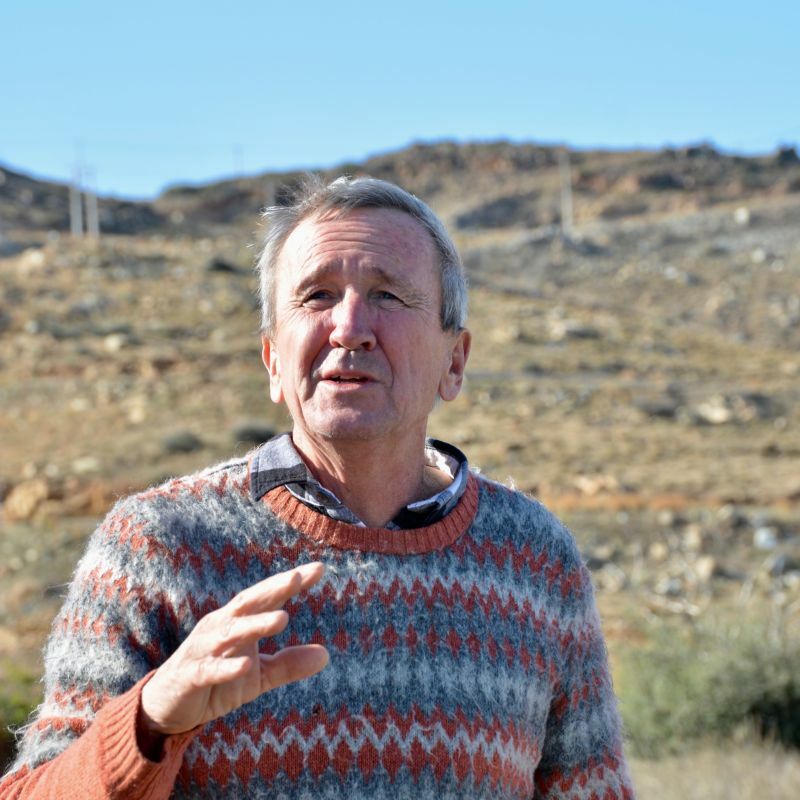 He told us about the design and construction of his house and the challenges of planting things in his garden which is subject to extremely strong winds for much of the year. 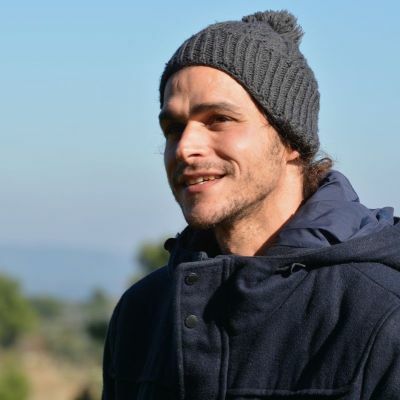 The garden was completely destroyed by fire two years ago and he is in the process of replanting and he is planting trees in the surrounding landscape and trying to encourage others to do the same. We walked around the property and onto the beach with James pointing out plants and things of note. After all this fresh air we sat down to a welcome lunch of delicious Greek fish soup in a local taverna. The MGS members on this visit would like to extend our thanks to Lilian, James Jennifer and Piers for their very interesting talks and for their generosity with their time, knowledge and enthusiasm. The morning was crisp and cold but the sun was warming when we met at Stamata just north of Athens for this visit to Ktima Kokotos Winery for a tour around the land and the permaculture vegetable garden. 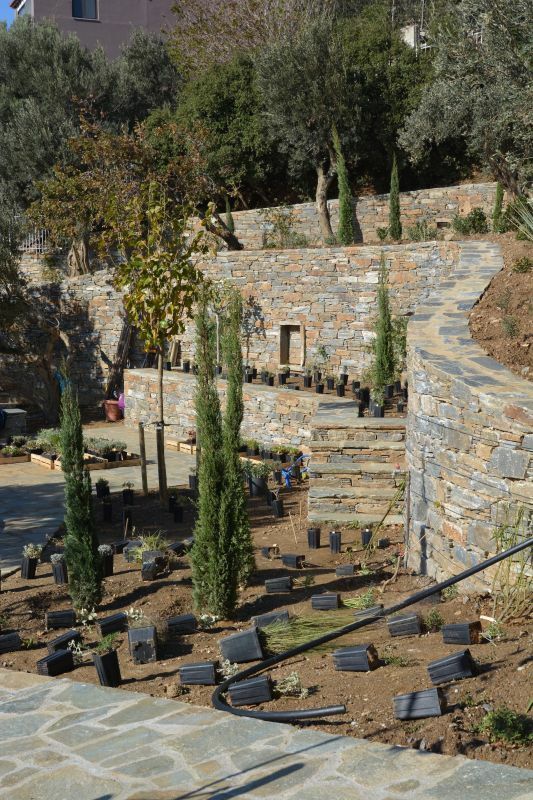 We were led by the designer of this garden: Alexandros Kostis. He explained that at its essence permaculture is a design science, a systematic thinking and problem-solving process. It is also a strategy to deal with and find solutions to soil erosion and degradation, biodiversity, placement of infrastructure. 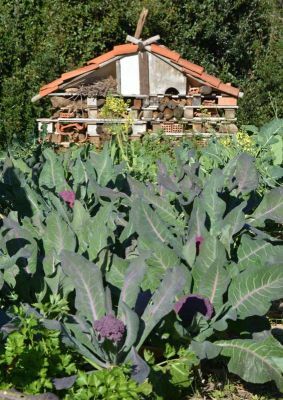 Permaculture can be explained as an umbrella of techniques combining ancient, traditional and modern. It is important to observe the land; to notice the direction of the flow of water, the wind, sun and soil. 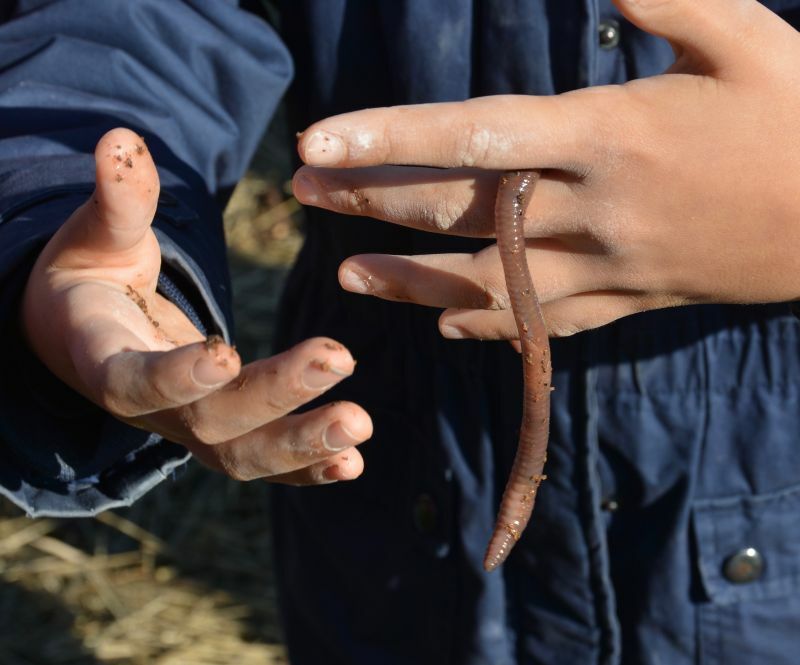 We learnt about the use of animals in the cycle of land use, the importance of taking the use and storage of water into consideration, the health of the soil, the vegetation and all the wildlife. He also told us something about the principles of design of eco-friendly houses. After meeting the ponies, we arrived at the vegetable garden started in August 2016 which has been set out in a circular design. 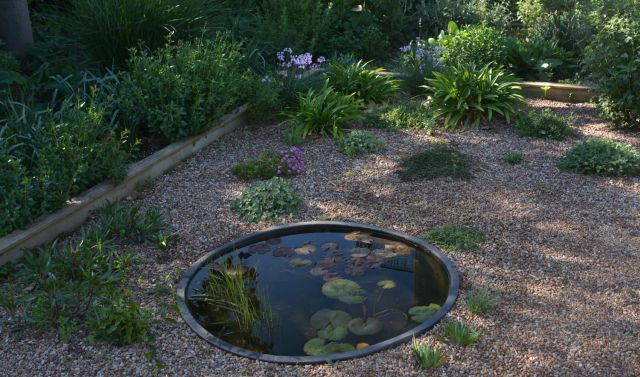 The family have a school here for children who spend a lot of their time learning about and interacting with nature and the design of the garden has taken all this into consideration. 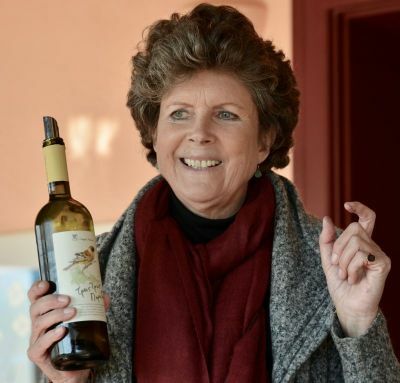 Following this we were shown the vineyards by Anne Kokotas and she talked us through the wine-making process. The first wines were produced in 1980 and all the grapes on this estate are grown organically and they incorporate permaculture principles into the process, including the planting of green manures between the vines to fertilise them. 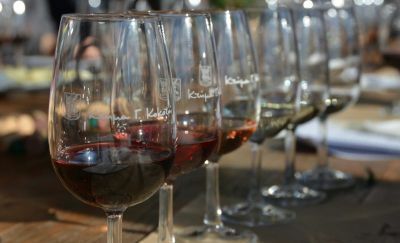 Then we enjoyed a tasting of six wines that they produce, sitting at a beautiful wooden table with the sun warming us through the windows down one side of the building. We left carrying wine and wonderful, freshly picked produce from the garden. Thank you to Alexandros and to Anne and all the family for such an interesting and enjoyable day. 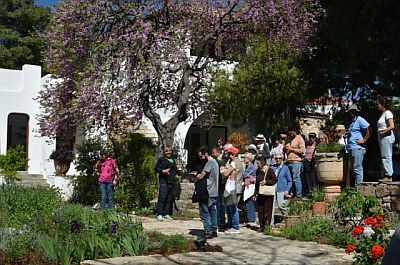 In early October MGS members met in Volos, gateway to the Pelion, to a welcome of tsipouro and mezes arranged by our hostess Sue Wake of Lagou Raxi. 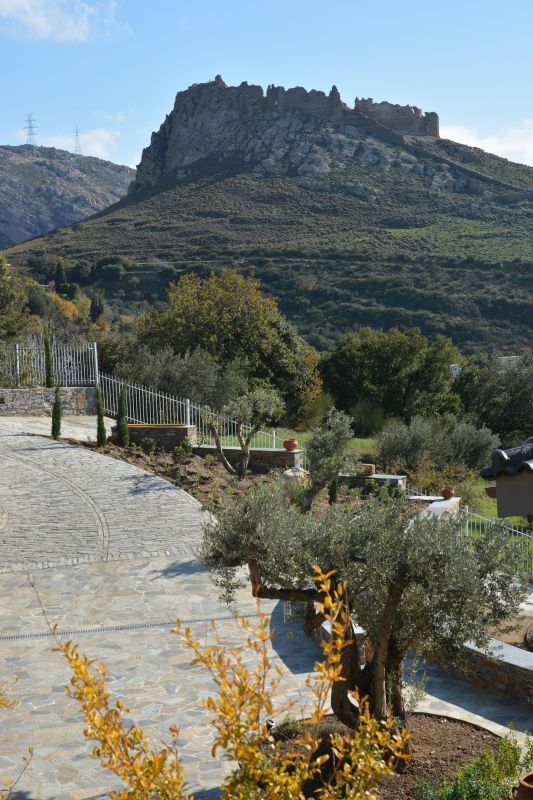 Our first stop was the garden of Annie and Ioannis. 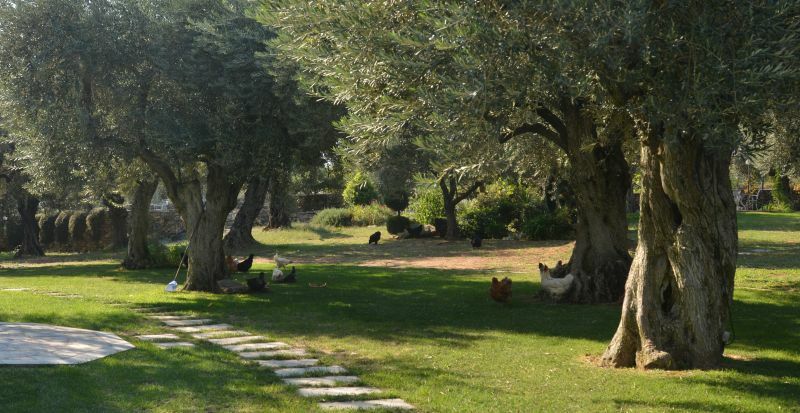 This mature garden is laid to lawn and set in an old Pelion olive grove: the lush grass had benefitted from the wet summer. 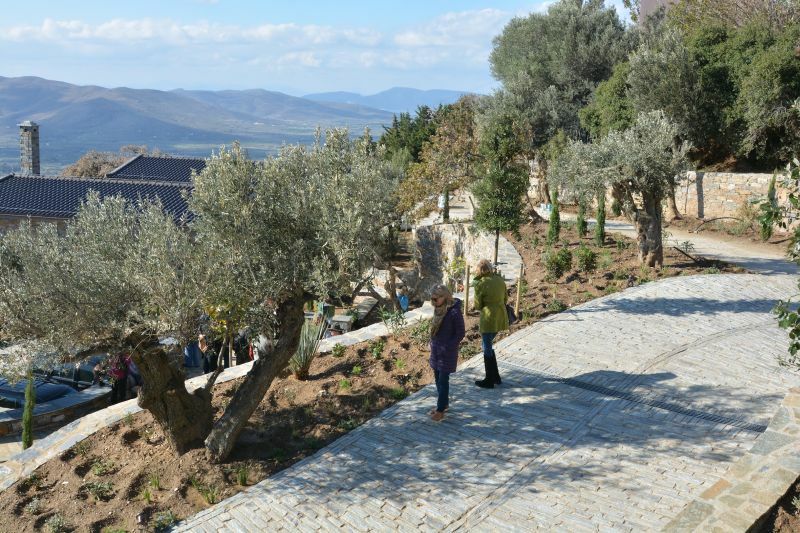 Though pruned for ornament and to provide shade for the garden, the olive trees still provide a rich harvest. 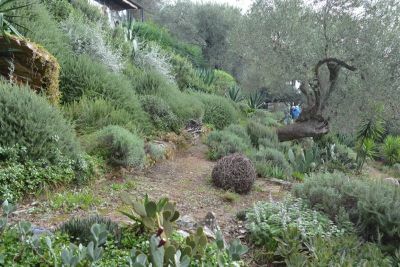 Planting was mainly in island beds with focal points of Phormium tenax, an occasional rocky outcrop, or precise topiary work, but it included mediterranean stalwarts such as Lavendula dentata, Rosmarinus officinalis, salvias, Tulbaghia violacaea and agapanthus. 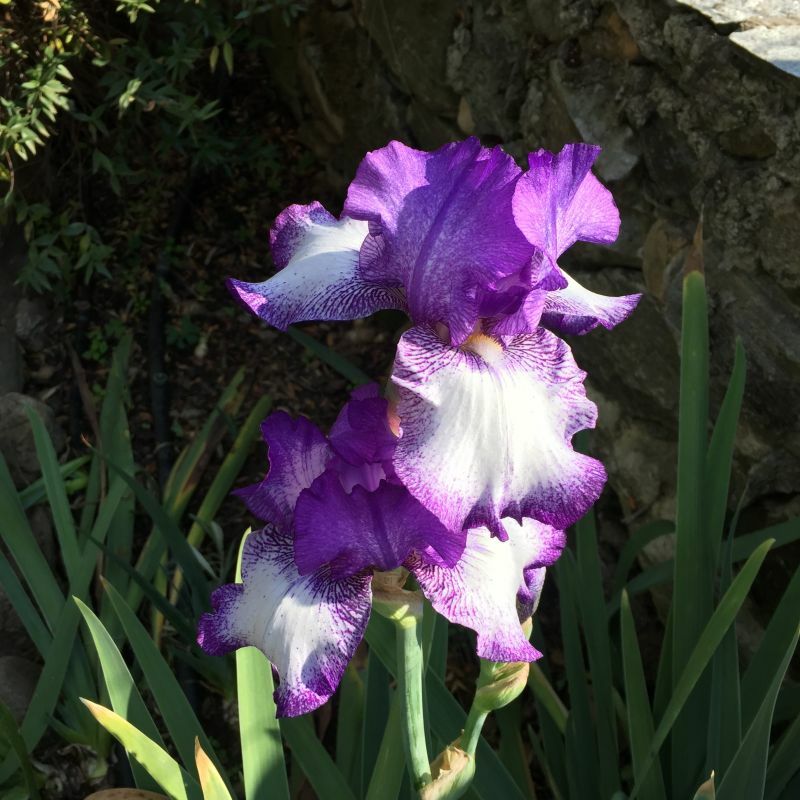 Those of us who were not iris experts were astonished by a beautiful Iris germanica hybrid blooming in the afternoon sun. 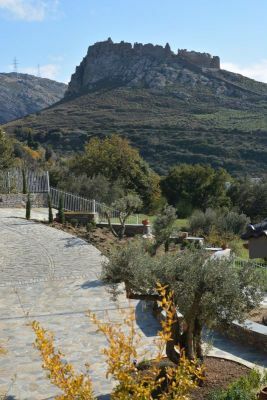 Some were also surprised to see Gardenia jasminoides used as underplanting for olive trees close to the house, their double white flowers offset against dark green foliage. Rampant Plumbago auriculata and golden-yellow Lantana camara mask the boundary fence. A row of hybrid tea roses divides parking from a productive vegetable patch with raised beds protected from free-ranging chickens, all rare breed birds and an ornamental feature of the garden. In the orchard we shared Ioannis’ despair over the condition of his Diospyros kaki but were full of admiration for his citrus trees which, though still young, were laden with fruit. Continuing along the coastal plain we passed small garden centres bright with autumn chrysanthemums before heading up into the mountains and arriving at our hotel, Lagou Raxi, in time for sunset. A short orientation walk took us past banks of Cyclamen graecum before stopping to admire native grasses glittering in the last of the light on one of the many restored kalderimi of the South Pelion. On a grey and windy first morning, we headed along the Trikeri coast road to the garden of designers Vida Chung and Vito. This visit was a delight and a source of inspiration for all. Steps down from the road took us past a small bed of cacti and succulents and across a small moss-covered courtyard at the back of the house before opening onto a series of east-facing terraces sheltered from the wind and ranged along the hillside above a small bay. The garden is accessed by small rough paths which zig-zag across the hillside. Shaded by old olive trees, succulents and cacti predominate, and repeat planting of Rosmarinus prostratus, Lavandula dentata and Teucrium fruticans cut into pleasing domes, along with simple ground covers such as Sedum spectabile, Aptenia cordifolia and tradescantia, combine to create a sense of unity and harmony. The garden relies more on foliage and shades of green and grey than on flowers. The effect is enhanced by a series of natural “artworks” that sit organically in the land. A “basket” of woven cut branches cradles olive suckers which are trained and carefully pruned to fit. Large spheres rolled from olive debris are wrapped in wire and rope. Balconies are cased in woven driftwood. 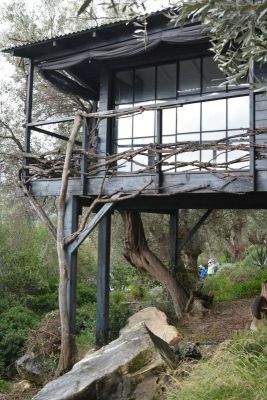 A “tree house” guest bedroom is astonishing, sitting above a sea of olives, as is a separate kitchen with a massive oven serving an outdoor seating area. The black wood finish of these buildings works beautifully with the greens and greys of the garden. Outdoor furniture and lighting are up-cycled, hand crafted and made with humour as well as style. 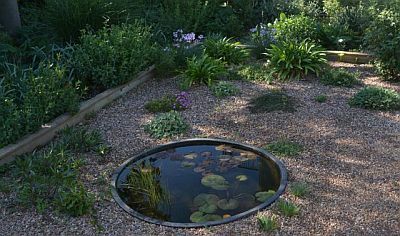 This is a very satisfying garden to visit, but not because of any sophisticated composition or the variety of its planting. It is a garden on a human scale, and one which you feel could be attained and managed by any of us if we had the ideas and originality of Vida and Vito. 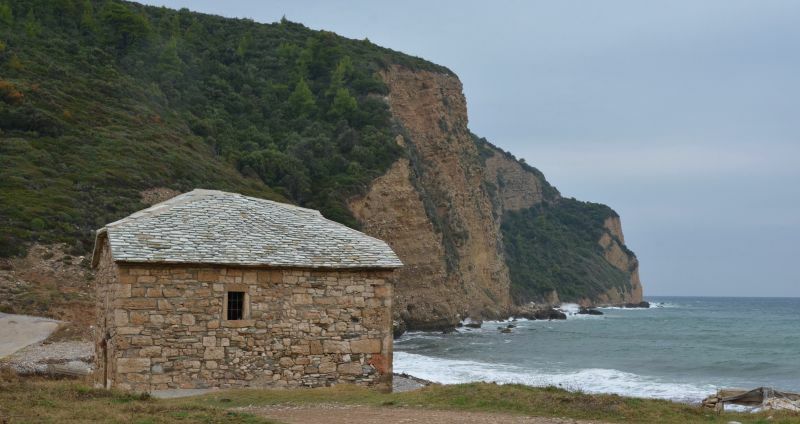 We travelled on to Theotokou on the wild and storm-hit east coast where the sea had recently run right up to the remains of a beautiful tessellated monastery floor. We quickly moved to the less windswept bay at Kati Georgios beach for lunch before travelling south to our next garden. 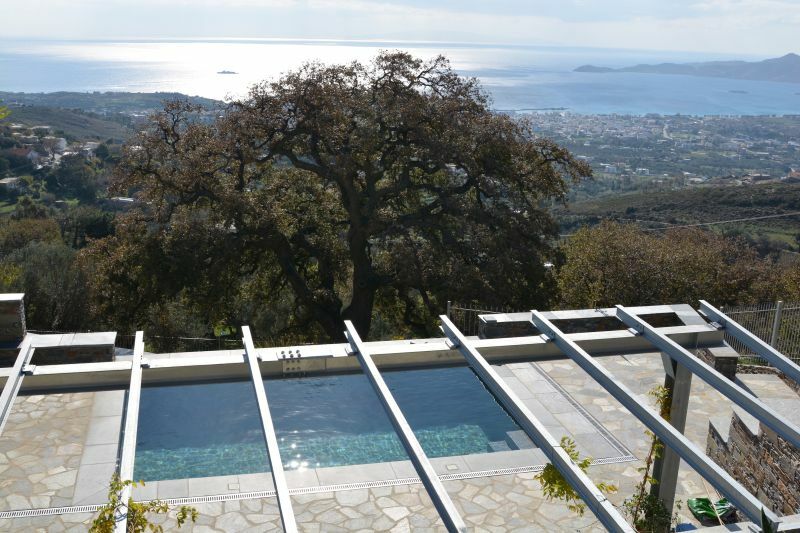 Looking towards Evia, the southwest facing coastal garden of Rudi Zelenka provided more food for thought. A long and vertiginous dirt road down through olive groves gave no indication of what to expect. In the parking area, our eyes were immediately caught by an Arbutus andrachne carefully pruned to make the most of the view. Down a steep path and under an arched gateway cut through the rock face, we entered a garden hugging the cliffs and arranged over a series of steep terraces down to the sea. Before the road was built, the house, most of which is hidden in the rock face, could be accessed only from the sea. 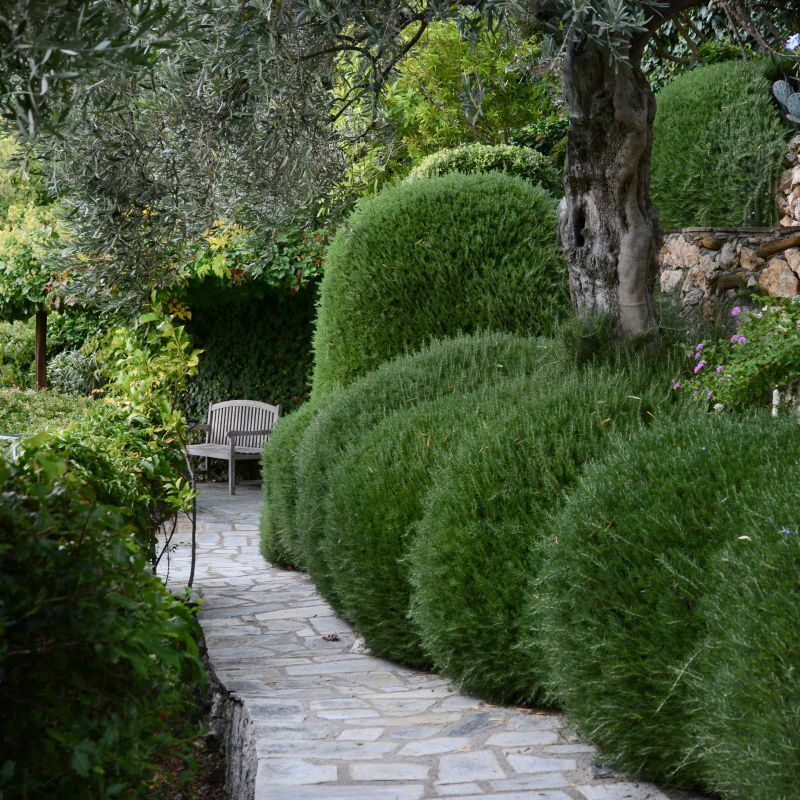 Over a series of steep terraces Rudi has used topiary to carefully manage the vegetation and to create a strong and unifying structure. 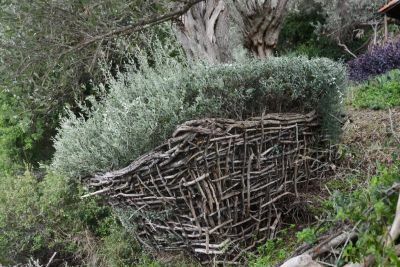 It includes good use of native coastal plants such as Arbutus unedo and andrachne, Rhamnus alaternus and Quercus coccifera and with banks of Rosmarinus officinalis and R. prostratus used to great effect along walkways and down staircases. Through this green canopy pop bushes of Tecoma capensis in the brightest orange, an exotic-looking large flowered pink mandevilla (probably), blue Plumbago auriculata alternating with Gaura lindheimeri ‘Siskyou Pink’ and a beautiful yellow Senna corymbosa. The weather did not dampen our spirits on Saturday. 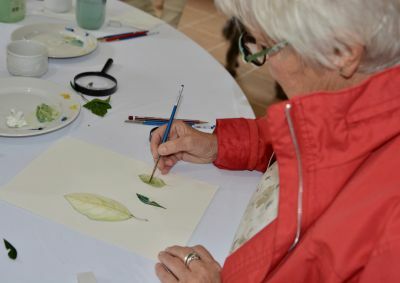 The group divided and while some walked the local kalderimi, others enjoyed an informative and companionable session on botanical painting led by the very talented Maggie Naigassas, a winner of an RHS Silver Gilt medal in 2018. The rest of the day was a full one, starting above Argolastis with a tour of the Pastisis organic vineyard and winery followed by a tasting of their excellent range of Pelion wines with family member Christos. We then travelled on to Paou Monastery, now a conference and cultural centre of the University of Thessaly. Here the priest, having forgiven us for our late arrival, permitted the group to enter St. Nicholas’ Church with its stunning frescoes and wall decorations. Lagou Raxi then laid on a splendid picnic lunch before we travelled on to the garden of Gereon and Karin, who we had met the previous evening when Gereon gave us an informative talk on grasses. A series of steep terraces lie immediately behind the house and more gentle terraces full of exotic fruit trees sit in front of the house, where there is also a series of ponds. The garden was full of fine exotic specimens including Bauhinia blakeana, Sophora japonica and Grevillea robusta. Gereon and Karin make good use of a shredder to mulch their collection. 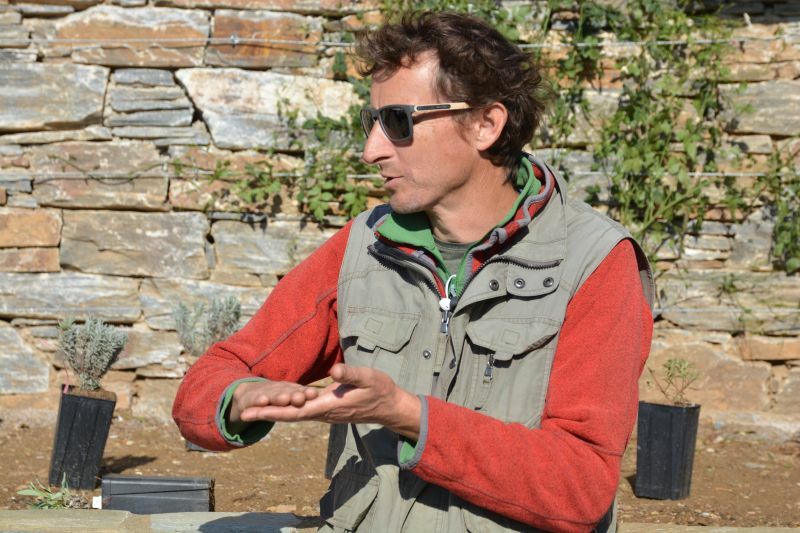 I had to return to the UK so missed Sunday’s programme but I heard that the members were impressed by Doris Schlepper’s Serpentin garden and had a splendid time at the mushroom festival in Tsangarada. You’ll be hearing more from MGS members around the Pelion in the coming year as we hope to set up our own small regional branch and we are also planning the post-AGM tour for 2019. A change in the programme which turned out to be an unexpected and most enjoyable experience. 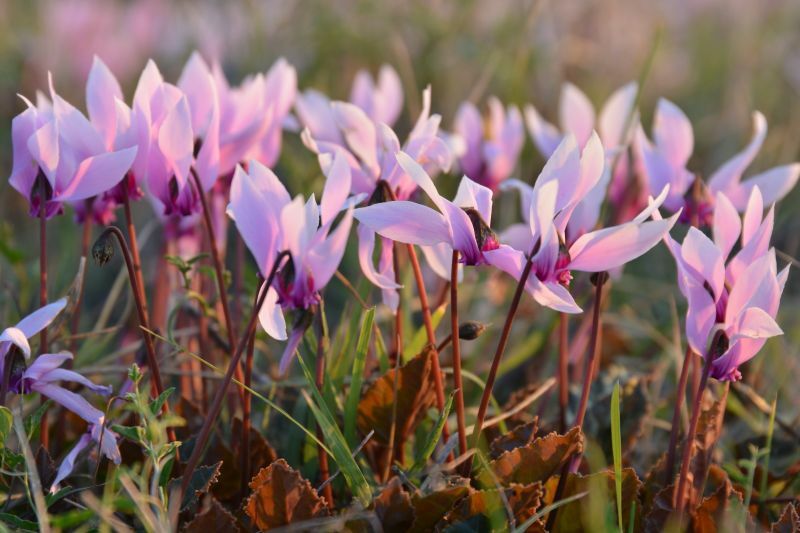 Upon meeting up in Volos, where the group gathered for mezedakia at a seafront tavern, we were introduced to Maggie Niagassas, botanical artist. The programmed “mushroom walk and foraging” had been cancelled and was to be replaced by an introduction to botanical drawing and painting. Having not put paintbrush to paper since art classes at school (a long time ago, believe me) I was somewhat dubious about whether to join in or whether to go along with others who had decided to go for a walk instead. But since it was cold and rainy and we were promised coffee, I stayed for the art class. Maggie led nine of us to the light and airy room she uses for her classes, where we sat around a large table already equipped with pencils, erasers and brushes. After a brief and very interesting introduction on the subject of botanical painting, and having had a look at some artwork and books, we were told to choose three leaves from a pile of foliage freshly picked. With some general guidelines and advice from our instructor (who basically told us to relax and enjoy ourselves) we set about reproducing our leaves as best we could. We were given some watercolour paints (two yellows and two blues) and left to mix up the greens we needed to match the colour of our subjects. Finally, we had a look at each other’s work and were amazed to see so many different styles. I thoroughly enjoyed this short session and would love to take more lessons. Hopefully Maggie will arrange a class in Athens one day soon. N.B. I have only one complaint: I now cannot see an interesting looking leaf without wanting to draw it! I wonder if the other participants have the same problem? Maggie gives week long courses in the spring and in the autumn at the Lagou Raxi Country Hotel. She explained that the courses were not all work but combined fun trips and visits along with some serious instruction. See her website at maggie-niagassas.com. This was our best-attended visit of the spring. About 35 members met up at one of Lefteris Dariotis’ gardens in Peania where we were given coffee and biscuits. 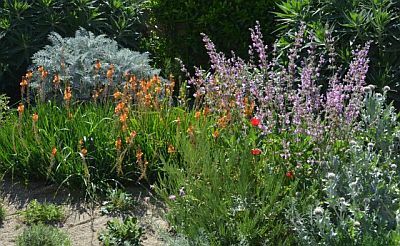 In this particular garden he grows many salvias, bulbs and other plants too numerous to mention by name. 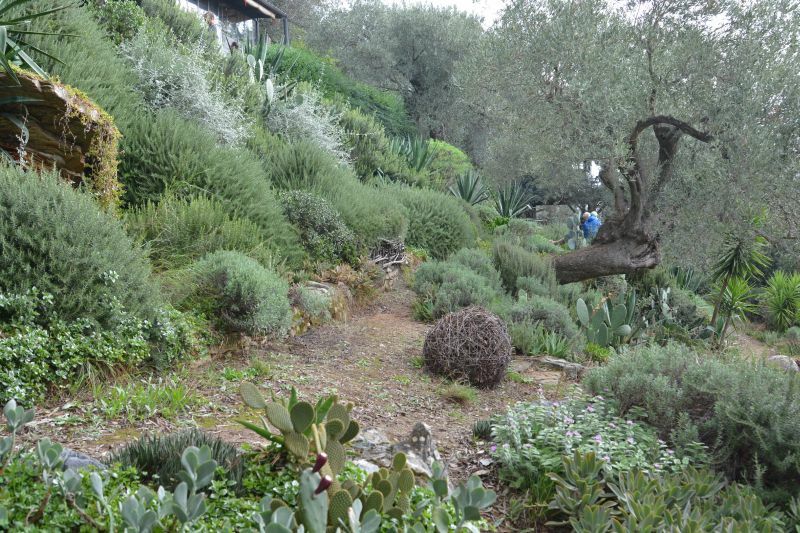 He has recently created a bed of alpine plants with a mulch of fine gravel which is looking fabulous. We then moved on to his ‘Goat Garden’. Here he has over 360 plants that are now grown with no water except for what they get from the sky. 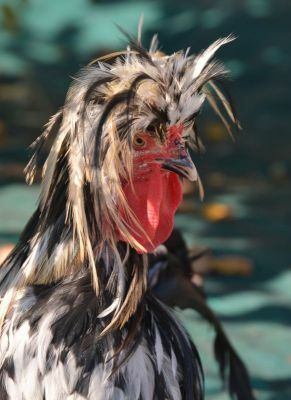 He started the garden four years ago. For the first year he watered the plants once every 10-20 days during the hot summer months. The second year he cut this down to every 20-30 days and for the last two years he has not watered these plants at all. 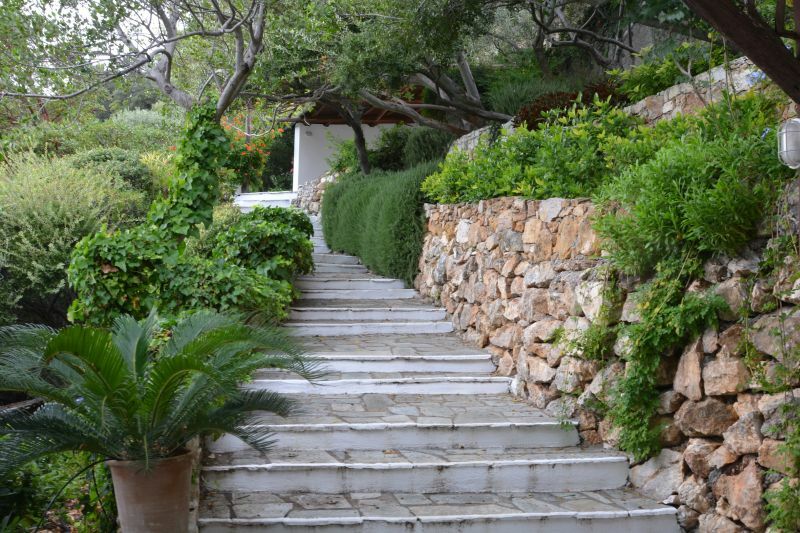 The majority of the plants are native to Greece and the garden looked fantastic with many of them being in flower. He said that he has not added any compost or soil improver to the garden, but he has added a thin layer of gravel mulch on top. This garden generated much interest from all the members. 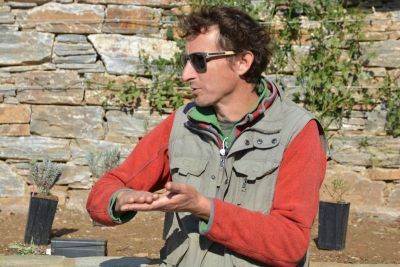 Finally, we visited the Vorres Museum where Lefteris has been involved in replanting some of the beds and pots with the aim of using less water. It was all looking wonderful, as always, and we were very interested to see the changes that have been made. For older reports and articles please check out the archived (non-responsive) Greek Branch page. Christina Lambert, Greek branch head writes: I am English but have spent the last 25 years living in this amazing country - Greece. For many of those years I had a large and productive, organic garden just outside Athens. I joined the Mediterranean Garden Society a few years ago. I have been the Branch Head of the Athens Branch for the last year and have also spent much time working at Sparoza. I now live in central Athens.